Leave Lisbon behind for the day, and see three of Portugal’s most characterful destinations, on this seamless, private tour. 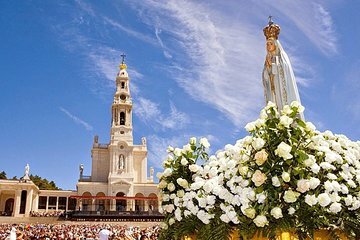 Set off in the morning from your Lisbon accommodation, and travel first to the Sanctuary of our Lady of Fátima, the largest Catholic pilgrimage site in Portugal. Next, venture to the village of Nazaré, famed for its seaside ambiance and record-breaking Atlantic waves. Finally, travel to the medieval town of Óbidos, famed for its historical city walls and ample charm.